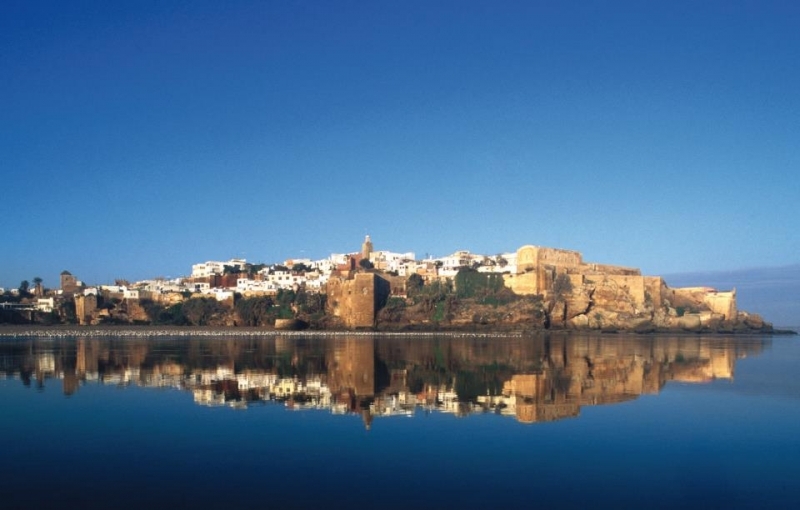 Sober and graceful, Rabat stretches serenely along the ocean’s edge. 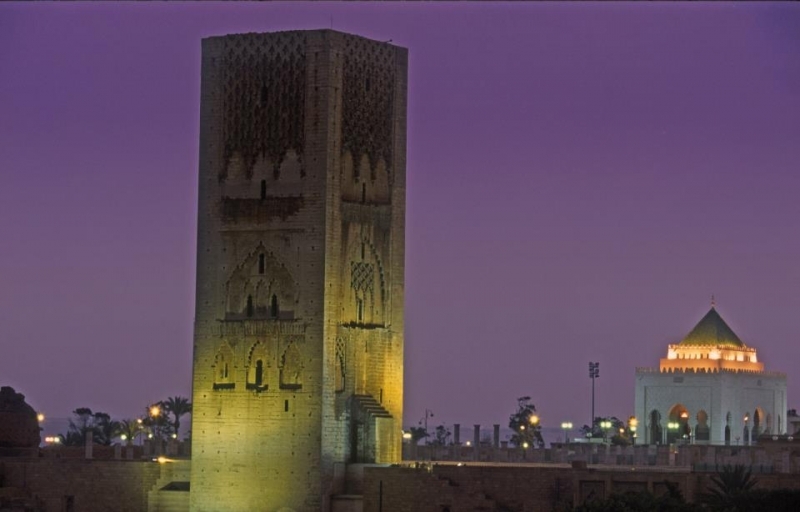 Hassan Tower, in all its force, is outlined against the sky, dominating an esplanade of marble pillars, the remnants of a mosque conceived in the 12th century so that the entire army of the sovereign Yaqub Al-Mansour could pray there. On this very esplanade stands the Mohammed V mausoleum, a veritable little palace. Finely-crafted marble, bronze and painted woods under a mahogany dome perforated with stained glass form the case enclosing the royal tombs carved into a chiseled block of white onyx and resting on a slab of onyx and dark blue granite which shimmers like water. In the south of the city, the gardens on Mechouar Square await you for a stroll by the royal palace. Go back toward the town centre and take the time to visit the archaeological museum: it presents the findings of excavations at several of the country’s archeological sites, notably Volubilis and Lixus. 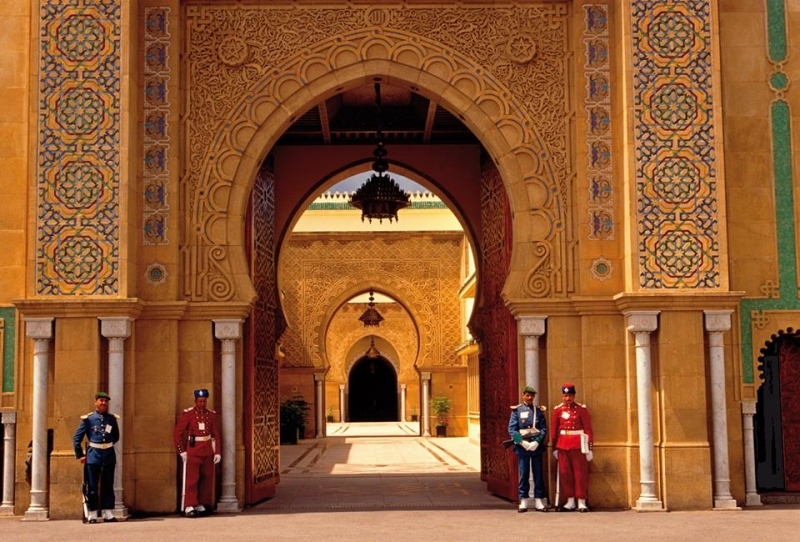 Also in the town centre, you will find Mohammed V Avenue, lined with art deco buildings. With its large agglomerations, wide avenues and parks, this area of the city harmoniously borders the old medina. In Rabat, the year is brimming with a wide variety of events and festivals, bearing witness to great cultural dynamism. In May, music holds the place of honor in the Mawazine world music festival. The International Alternative Film Festival takes place in June, and music returns to centre stage in November with the Plucked String Instrument Festival. Beyond the city’s ramparts, other walls conceal an enchanting place: this small, fertile valley, with its prickly pear trees, palm trees and olive trees, was chosen by the Merinides dynasty in the 13th century to accommodate their final residency. Stroll through the sepulchers in the shade of the ruins of a sanctuary where the minaret acts as refuge to the storks. A little further along stand other ruins of a more distant past: those of Sala la Romaine. Made of adobe in the 12th century, the Andalusian ramparts protect the south side of the medina. The rectilinear layout of the old city is impressive as it is very different from the traditional mazes of streets. You can enter through the Bab El Had gate, scene of the Sunday market. This is where Souika street begins, the biggest and probably most animated in the medina. It leads to the Great Mosque and ends up at the Souk Es Sebat, the shoe market covered with reed mats and overflowing with hundreds of babouches, leather and handcraft goods and gold and silver jewelry. Then, along Rue des Consuls, which is partially covered by glass roofs, artisans work before your eyes on their deep-pile carpets, fabrics and copper objects. Heading back north, you approach the gate of the Oudayas. This fortress quarter conserved its old cannons positioned on a bulwark. Beautiful and massive, its door is carved from top to bottom, and one of the towers houses three art galleries. The white and blue facades create a very Mediterranean ambiance. Its cobblestone streets lead to El Atiqa mosque, the city’s oldest, and then to the platform of the ancient semaphore. From here, as from the terrace of café Maure just nearby, the view of Rabat, its neighbour Salé, and the meeting of Bouregreg river and the ocean is simply splendid. From up high, the Oudayas Palace, which today houses the national museum, has conserved its original ornementations, imprints of sobriety and equilibrium. The Andalusian garden at its feet is a haven of peacefulness full of fruit trees, rosebays and cascades of bougainvilleas. 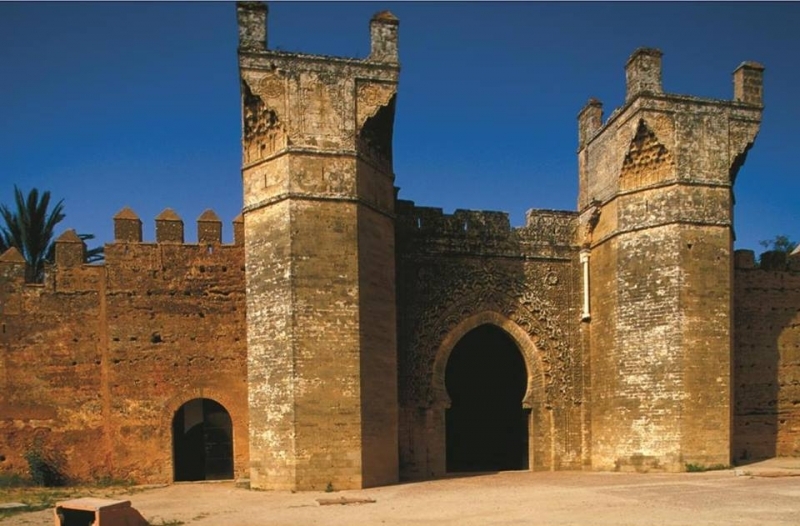 - Check our day tour to Rabat from Casablanca.